The "On Deck Kitchens" story On Deck Kitchens was born in 2008 after we noticed a distinct lack of dedicated, quality Outdoor Kitchen manufacturers in Melbourne. Other states in Australia had them, why not us down here? Our workshop is located on a farm in Devon Meadows and yes, we know you’ve never heard of it! It’s only 50km South East of the CBD, so we easily service all areas of Greater Melbourne and even regional Victoria too. In the last 12 months we have completed projects as far and wide as Bendigo, Mount Macedon, Geelong and many more. With a small, client-focused team we are always striving to give you the best service regardless of if your project is large or small, near or far. We believe heavily in sustainability, and eco friendly processes. By creating outdoor kitchens built from the right materials, we are trying to eliminate the cycle of cheap products being thrown out and filling up garbage tips and landfill, damaging the environment. Cooking outdoors is one of life’s great pleasures, and it’s a great privilege to be able to create these fantastic entertaining spaces for our clients. 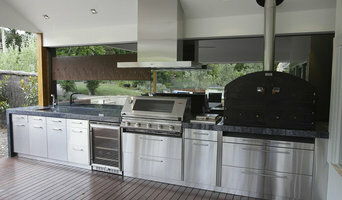 Get in touch with us to discuss your outdoor kitchen project. We look forward to working with you! We care about designing a stylish quality ergonomic kitchen bathroom for you. Using our 3D software you can see the finished result. 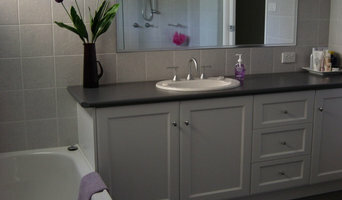 Creative Style Kitchens is a Geelong-based cabinetry business with qualified cabinet makers specialising in kitchens, bathrooms and bathroom vanities, and laundries and laundry cabinets. Owner and qualified cabinet maker Ray Jazyna, a Geelong local, has been in the cabinetry game for many years and takes pride in Creative Style Kitchens being the best in the business. Our professional team of cabinetry experts can come to you for a free measure and quote anywhere in our service area. Whether you’re renovating your kitchen in Geelong, upgrading your bathroom vanities, looking for new laundry cabinets or want new cupboards or storage installed in your home our office, Creative Style Kitchens is your best choice. Cazam Kitchens is an Australian owned and family operated business that has successfully designed and manufactured custom made cabinetry for over 25 years. Specialists in bespoke joinery, Cazam Kitchens has quickly become the preferred joinery supplier to many leading commercial & residential clients. Our range of services include multilevel developments to custom made kitchens, bathrooms, laundries, wardrobes, entertainments units and more. Our aim at Cazam is to turn your dream into our creation. 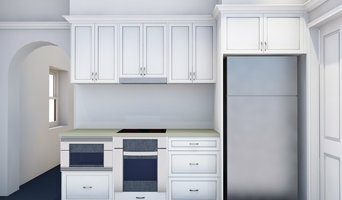 From design and construction to installation of your new kitchen and home cabinetry, we make ourselves available to answer any of your questions and keep you updated throughout the entire process. Quality Assurance at completion gives you peace of mind and our 7 Year Warranty is our promise to you that we are still only a phone call away. Archies Kitchens have been manufacturing first class cabinetry for over 20 years and we have a solid reputation for delivery quality. Our mission is to provide and maintain the highest value of customer service. We provide advise and design ideas and work in well with your needs and budget. 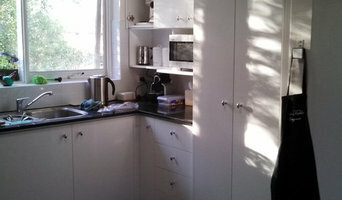 Independant Kitchen Designer offering original design with support and guidance. Form Concrete Artisans design and manufacture fine interior concrete features. In recent years, architects, interior designers and homeowners have begun to appreciate concrete for its superior functionality, aesthetics and flexibility in any space. With considerable experience in carpentry and quality furniture construction, Form Concrete Artisans work alongside industry professionals and the end user to create handmade, one-off pieces for home or business. Utilising advanced concrete technology, sealants and reinforcement, Form Concrete Artisans turn humble concrete into sleek, sophisticated and hard-wearing features. We specialise in custom furniture, including dining and coffee tables, kitchen bench tops, fireplace surrounds, vanities and splashbacks. To design your own truly unique bespoke furniture, choose from a wide variety of colours and an astounding array of finishes, from highly textured through to mirror-like. Concrete can be used in conjunction with wood, and personalised touches such as inlaid objects can also be incorporated. Based in Torquay, we service the Surf Coast, Geelong, Melbourne and surrounding areas. Joinery manufacturing providing one stop solutions for commercial and residential projects, delivering quality and service using modern technology. 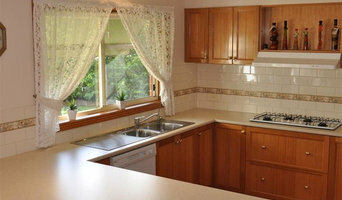 Famous Frameless is the most reliable and quality service provider of splashbacks. We offer a comprehensive range of splashbacks that includes glass splashbacks, kitchen splashbacks, mirror splashbacks and printed splashbacks. With our accurate measuring skills, latest technologies and glass cutting abilities, we provide the best quality splashbacks with minimum number of joints in it. We offer fully customised splashbacks solution. We measure and manufacture to suit your needs and budget perfectly. We always carry samples with us for you to compare the style and finishes and choose the one that perfectly suits your kitchen style. Once the job is done, our professional team will clean after themselves. We serve in Melbourne’s Western, Northern and inner Eastern suburbs that include Preston, Essendon, Moonee Ponds and Niddrie. If you’re thinking of renovating your home and want a team highly trained professionals for the job, then you need A to Z Joinery Solutions and Installs. A to Z Joinery Solutions and Installs specialise in improving bathrooms, bringing kitchens to life, and making laundries more practical. The company was established 38 years ago by Domenico Gianfala as a sole operator. Now with the continual expansion of the business Domenico's two sons help run the company then gradually employed apprentices and moved to a larger premises. We now have 10 employees consisting of apprentices and tradesmen. We have many kind of clientele and the majority of our work is from recommendation from existing clients as we do not advertise. We are manufacturers of high quality cabinets and we have a wide range of products including vinyl wrap, solid timber kitchens, imperite and can also organise stone bench tops, glass splash backs and all kitchen appliances. We also do office and shop fittings for commercial market and architecturally designed joinery. There are many types of kitchen professionals in Geelong, Victoria – from cabinet makers, to carpenters and interior designers – and many trade professionals offer a full suite of expertise. Depending on the size of your kitchen renovation, and the kitchen designer, they may also hire contractors on your behalf and manage the project from beginning to end. Here are some related professionals and vendors to complement the work of kitchen & bathroom designers: Kitchen & Bathroom Fixtures, Appliances, Tile, Stone & Benchtops, Joinery and Cabinet Makers, Carpenters. Find a Geelong, Victoria kitchen designer on Houzz. Browse the Professional section on Houzz to find kitchen designers in Geelong, Victoria. Then, scroll through photos of their latest kitchen renovations and see how their work compares to the scope of your project. You can read reviews to see how other homeowners rate their work, and message them directly to to ask any specific questions.